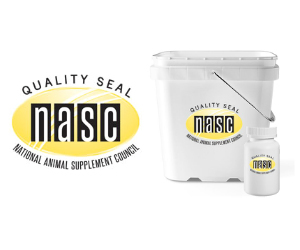 What Does the NASC Quality Seal Mean on Equine Supplements? We are pleased to report that NASC was a topic of conversation during December’s Ask TheHorse Live webinar. Clair Thunes, PhD, independent equine nutrition consultant and owner of Summit Equine Nutrition in Sacramento, CA, took on a question from a horse owner who wanted to know what the NASC Quality Seal means on equine supplements. Click here to listen to Clair’s spot-on response, and check out our graphic below!